With the official unveiling of Avatar’s and Banjo-Kazooie’s appearances in Sonic & SEGA All Stars Racing some new screenshots have been revealed of those characters in the game. One interesting tidbit in the screenshot showing the Avatar’s All-Star move is the updated HUD that has a tracking bar instead of a map indicating how far you and your opponents are from the finish line. Wether this will be used instead of a map or as a seperate option to maps we can only guess until we receive confirmation from SEGA/Sumo Digital. Thanks to NinMicroSega over at the SSMB for the non-Silverlight link. 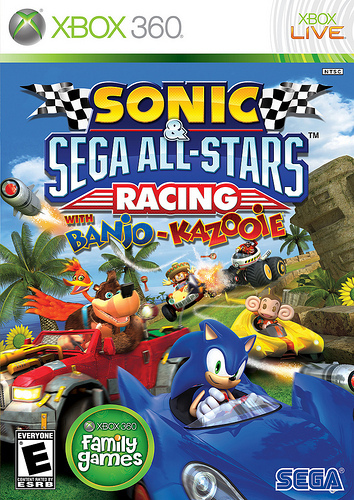 A new trailer for Sonic & SEGA All Stars Racing featuring Banjo-Kazooie has just hit Xbox Live on Xbox 3660. The trailer weighs in at 72.12MB. The trailer is now available via the Marketplace on the official Xbox web site too. – Shadow’s All-Star Move is, you guessed it Super Shadow! – The Avatar’s All-Star Move gathers your friends Avatar’s to lift your vehicle and run while carrying your car to give you what looks to be a comical boost in speed while bashing through opponents. – A track that looks like Dino Mountain from Billy Hatcher is shown. – A Tokyo type city track is also shown, possibly representing Yakuza, Shenmue or Jet Set/Grind Radio. – Banjo-Kazooie’s vehicle’s license plate says BANJO for anyone interested. – Final Fortress from Sonic Heroes also appears as a new track. – Banjo Kazooie’s All-Star Move has Kazooie peck Banjo’s head then get out her magical wrench from Nuts & Bolts to throw Jiggies behind them to attack their opponents. – Amy is shown attacking Tails with a giant blue ball item. – Banjo Kazooie’s vehicle has the Rare logo as a hood ornament. 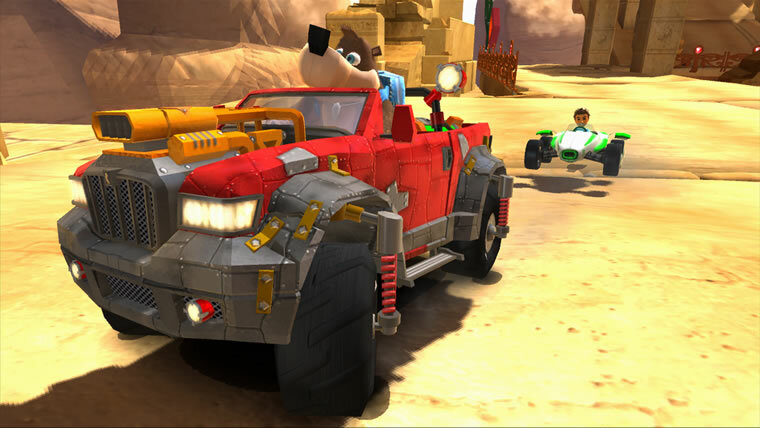 – The trailer’s description reveals Banjo-Kazooie’s vehicle to be named the ‘Bolt Bucket’ Jeep and the Avatar’s vehicle to be called the ‘Avacar’. – The UK official Xbox site is now displaying the same box art as the U.S. with Banjo Kazooie on the front so that’s the UK Xbox 360 box art confirmed. The desert track shown is from Super Monkey Ball. If you pause the trailer at the part where Banjo stands up and waves at everyone behind him to the left you can see a giant stone wheel with AiAi and Mee-Mee’s faces on with a picture of a banana. The track also has banana peel obstacles too. Super Monkey Ball character statues can also be seen at the end of the trailer. Steve Lycett from Sumo Digital under his nickname S0L has confirmed via the SSMB that the Tokyo track is from the Jet Set Radio games. Steve also assures fans that Bajo-Kazooie are on the disc and not downloadable content. 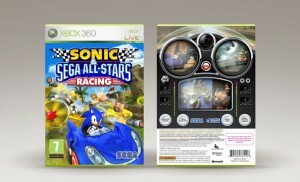 SEGA of America community staff member Kellie has officialy unveiled the Sonic & SEGA All Stars Racing U.S. box artworks via the SEGA of America blog, in hi-res too. Banjo-Kazooie are still on the Xbox 360 version cover confirming their presence in the game 1,000 times over. The Nintendo Wi-Fi Connection logo is still present on the Wii and DS box arts laying to rest any worries about the online feature for those versions.